Plan to stay Fit. It's Me, J.Marie. 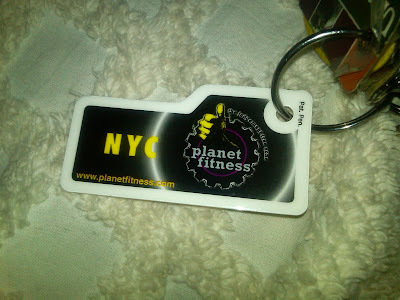 At Planet Fitness. Today, I was having a chat with my old roommate Jerrell, and she was telling me about her experiences with getting and staying in shape through training for marathons and attending bootcamp. I remember when we lived together, we'd always talk about how we needed to workout more and eat right (as we waited for our Chinese to arrive). So having her tell me about making running a regular thing and reading her blog www.poshsblackbook.com motivated me to start making working out a part of my regular routine. A Planet Fitness just opened up not too long ago less than a mile away from my house, literally 2 blocks, and I saw this as a better time than ever to join and start working out! With the membership package I signed up for, I get half price on all of their beverages, a free tshirt, a free key card, free unlimited tanning (even though I have a permanent tan haha), free unlimited post/pre workout massages, and a free personal trainer whenever I need it. Not bad! As soon as I signed up, I went upstairs and got to working out. It was pretty intense; it needed to be, and a few men even helped me train as we took turns with the ab sets. They stayed on me, making sure I didn't cheat, and even made me repeat sets when they thought I did. I'm so excited about this gym, and I actually see myself liking it enough to attend regularly!